Rafael Frühbeck de Burgos served up an appetizing mélange to the BSO audience Thursday that befitted his polyglot name: Beethoven’s Symphony No. 6 in F, Opus 68, “Pastoral”; the world premiere of American composer Marc Neikrug’s Concerto for Bassoon and Orchestra; and Suites Nos. 1 and 2 from Falla’s The Three-Cornered Hat. Despite being written during the personal turmoil of his encroaching deafness, Beethoven’s “Pastoral” is one of his sunniest and most open-hearted works; perhaps this accounts for the need some conductors feel to “interpret” the piece. Happily, Frühbeck is not one of these, taking instead a direct and simple approach that merely gave graceful phrase inflections and those tempo variances indicated by the composer. When a theme was passed from orchestral section to section, there was no highlighting: the conductor rightly trusted Beethoven’s orchestration and the pellucid acoustics of Symphony Hall to take care of balances. The rather leisurely tempo of the first movement (“Awakening of happy feelings upon reaching the countryside”) took time to enjoy the view which, thanks to silken strings and silvery winds, was lovely. In the second movement (“Scene at the brook”), the caress of the muted strings and the murmuring brook figure were soothing but never soporific. Near the end the “bird trio” of flute, oboe, and clarinet—nightingale, quail, and cuckoo—made us smile. (Beethoven had criticized Haydn for the tone-painting in the latter’s The Creation and The Seasons, but here, no doubt after some inner conflict, he indulges himself in the same “vice”—and with perhaps less subtlety than Haydn had.) The third movement’s “Cheerful gathering of country folk” was not as fast as some, but Frühbeck gave it such vim and vigor that there was no question this was a celebratory dance. When the storm burst in, it was appropriately spine-tingling, though the enormous thunder of the timpani did obscure some of Beethoven’s harmonies, wild for their time. Perhaps the conductor’s one interpretive touch was making the first statement of the final movement’s theme (“Shepherd’s song. Happy, grateful feelings after the storm”) unusually subdued, as though the people weren’t quite sure the storm was really over; of course, their confidence grew quickly thereafter. The apotheosis had the soaring nobility of a hymn of praise. Still, no matter how broadly the final two chords are played, for me they always recall both horn call and cuckoo. The Concerto for Bassoon and Orchestra of Marc Neikrug (b. 1946), though “instigated originally by a bassoonist friend,” became a commission for the principal bassoonists of four orchestras: the Boston Symphony (with generous support from the Massachusetts Cultural Council’s New Works Fund), the Milwaukee Symphony, the National Symphony, and the National Arts Centre Orchestra, Ottawa. 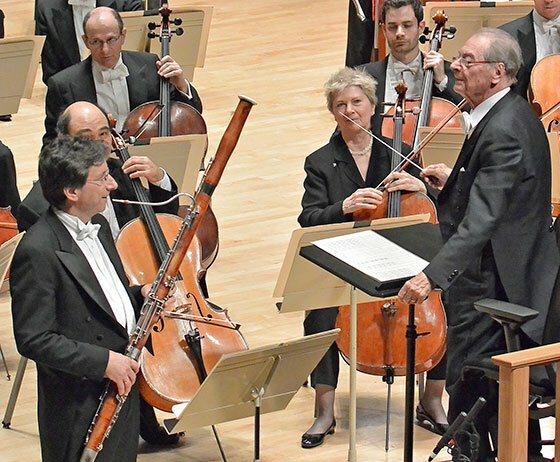 This performance by the BSO and its principal bassoonist, Richard Svoboda, was the concerto’s world premiere. Although the bassoon is the orchestral comic voice par excellence, Neikrug took the opportunity to highlight its other qualities. Utilizing a traditional three-movement/fast-slow-fast structure and a largely atonal harmonic language, the composer emphasized the instrument’s dramatic capabilities in the outer movements and its lyrical, plaintive side in the inner movement. Neikrug specifies a large number of percussion instruments for three players: small, medium, and large suspended cymbals, triangle, maracas, marimba, crotales, xylophone, whip, tambourine, tam-tam, anvil, vibraphone, bass drum, tam-tam with bow, side drum, mark tree, two gongs, and celesta. These accentuate the drama of the first movement, created by the large, leaping intervals in the solo bassoon as well as the contrast of the improvisatory solo part and the more four-square orchestral interludes. The middle movement was perhaps the most emotionally affecting: Svoboda’s chromatic sighing figures evoked grief-stricken groans; he also had a melancholy duet with the English horn. In a fascinating bit of orchestration, Neikrug also pairs the bassoon, high in its range, with the bass clarinet, low in its range; the effect was eerie. In this dreamlike atmosphere the concluding diatonic chord felt surreal. The final movement generated its drama mainly by the use of shakes, “rapid oscillations between non-adjacent notes, which create a resonant sound peculiar to the instrument.” After these shakes have found their way into the orchestra as well, the work reaches a climax followed by an extended cadenza for the solo bassoon and a tutti plunge to the end. Svoboda made skillful use of the concerto’s opportunities to show less explored sides of the bassoon, and Frühbeck impressively mastered the complexities of the full score while simultaneously creating successive atmospheres. Neikrug, in Nehru jacket and making namaste, was on hand to receive the enthusiastic applause of the audience. The program of stark contrasts ended with Suites 1 and 2 from Manuel de Falla’s ballet El sombrero de tres picos (The Three-Cornered Hat), a Spanish fable about a miller, his beautiful wife, and a corregidor, a provincial magistrate whose authority is symbolized by the eponymous hat. Unlike Beethoven, Falla surely had no qualms about tone-painting for this score is filled with it; a savvy composer of a ballet, hoping to have it performed as a concert piece as well as ballet, will, at the least, suggest the story with musical means. Under Frühbeck’s knowing direction, the BSO vividly characterized and narrated, using the various Spanish dance forms Falla incorporated into his ballet. It was a pity not to hear the entire ballet (which I’m guessing would have added only around 10 minutes to the concert’s length), but fortunately, the program notes helpfully outlined the entire story, simply bracketing the parts not played. Having noticed the corregidor’s wandering eye and deciding to teach him a lesson, the miller’s wife, pretending not to be aware of his presence, dances a fandango: conductor and orchestra generated considerable heat here. When the magistrate approaches her, in a complete turn-about she becomes playful and girlish, offering him grapes and snatching them away repeatedly. Violins and flute tickled and giggled delightfully. When the miller later asserts his authority as husband (the story was created in the less enlightened days of 1874), Falla uses a farruca. The performance blustered and stomped, full of machismo and featuring an exciting accelerando even if it was telegraphed at its commencement. In the concluding jota Frühbeck opted for visceral excitement over detail, sometimes letting the exuberant brass and percussion cover the strings; also, some of his rubatos were so large that dancers might have been left scratching their heads, but in a concert performance this maximized the drama without being allowed to become vulgar. When the castanets arrived for the final statements of the main theme, clacking on every beat, some in the audience could be seen moving with them. At the end came a delirious coda and a final flurry of unaccompanied castanets before the concluding chord, an electrifying ending to an eclectic evening. The only performances in Symphony Hall of Falla’s full work were 37 years ago. Complete ballet next time, BSO? Still, no matter how broadly the final two chords are played, for me they always recall both horn call and cuckoo. In the music GOD’s name, I say it appears that the comment is anti-intelligent and the conclusion is anti-aesthetic. Are they really necessary? Agreed, the Falla Three-Cornered Hat is a first-rate score complete. And when was the last time the BSO played “Nights in the Gardens of Spain” at SH? C’mon, BSO, give ’em to us! For that matter, Dutoit conducts the BSO thrice-yearly at SH and also at Tanglewood. You should get him to conduct Honegger’s “King David” too, either the chamber version or full-orchestra version. Again, c’mon, BSO, show some imagination. During the interregnum, I’d have thought that guest conductors would have an even freer hand than usual in selecting the music they will conduct. Maybe they too need to show some imagination.